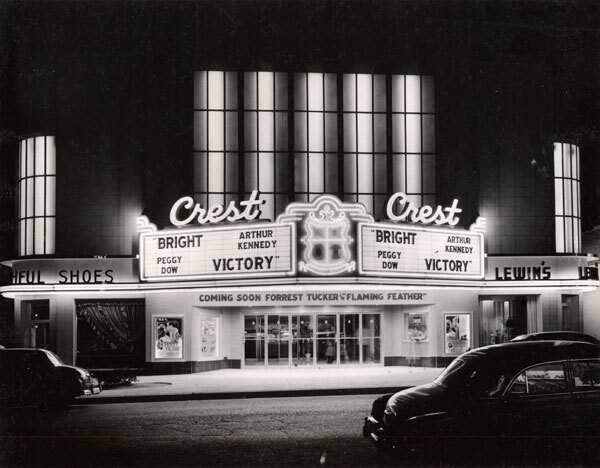 Description: Looking south in night view of Crest Theatre exterior, 4825 East Douglas Avenue. Built in 1950, near Lincoln Heights Shopping Center at Oliver and Douglas. The theatre was demolished in 1997. Also in view, Lewin’s Little Shop, 4823 East Douglas and Youthful Shoes, 4827 East Douglas. The motion picture “Bright Victory” was released in 1951. Keywords: Arts and entertainment, business and industry, sports and recreation, street scenes transportation, automobiles, neon, movies, films, Flaming Feather, Arthur Kennedy, Peggy Dow, Forrest Tucker, Wichita, architecture. 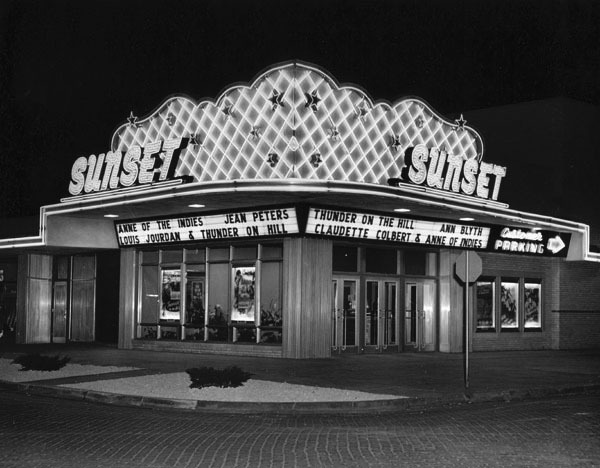 Description: Looking southeast in night view of Sunset Theatre at 1600 Lulu Avenue. The motion pictures “Thunder on the Hill” and Anne of the Indies” were released in 1951. Keywords: Arts and entertainment, business and industry, sports and recreation, movies, films, neon, Claudette Colbert, Ann Blyth, Louis Jourdan, Jean Peters, architecture, Wichita. 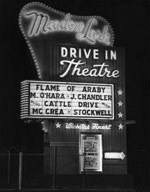 Description: Night view of marquee for the Meadow Lark Drive In Theatre at 4445 East Harry. The motion pictures “Flame of Araby” and “Cattle Drive” were released in 1951. Keywords: Arts and entertainment, business and industry, sports and recreation, movies, films, neon, Maureen O’Hara, Joel Chandler, Joel McCrea, Dean Stockwell, architecture, Wichita. 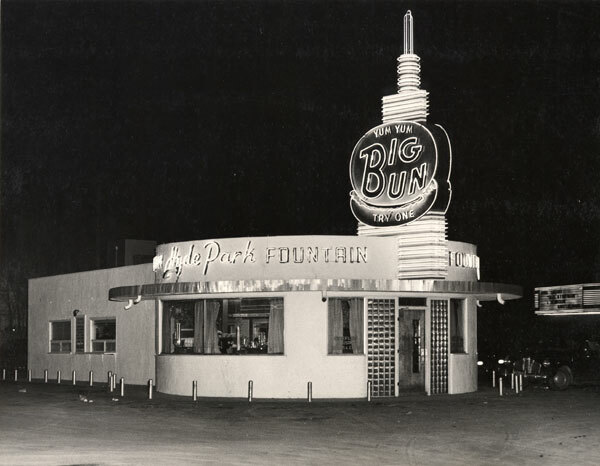 Title/Object Name: Big Bun, Inc. Description: Looking northeast at the Big Bun restaurant, 4724 East Central. The menu featured a loose meat sandwich on an oversized hamburger bun; inside seating and curb service available. The Tower Theatre (4802 East Central) marquee is partially in view at right, showing a movie entitled "Tales of Helpmann" starring Moira Shearer. 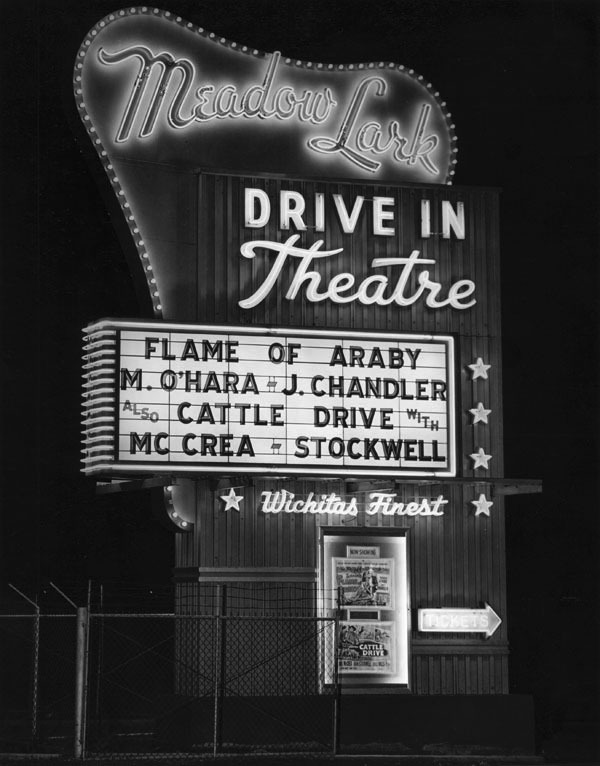 Keywords: Wichita, arts and entertainment, business and industry, neon, art moderne, modern, glass brick, architecture, drive-in, restaurant, cafe. 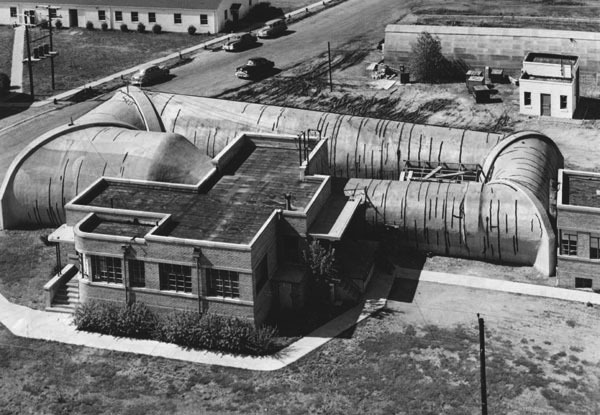 Description: Aerial view of Walter H. Beech Memorial Wind Tunnel at University of Wichita. View is looking north. Photograph taken June 30, 1951. Keywords: Wichita, aerials, aviation, education. 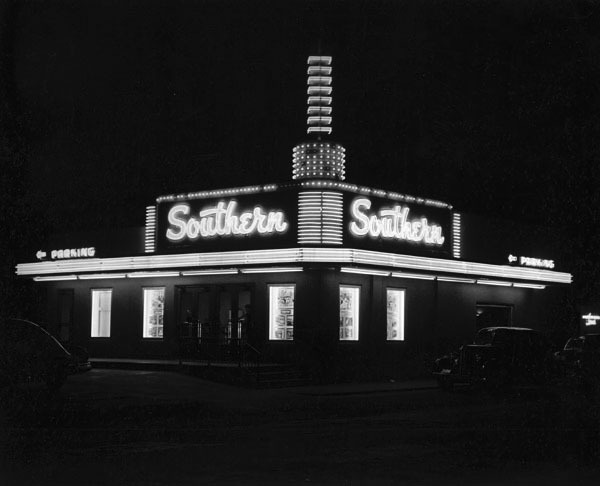 Description: Night view, exterior of Southern Theatre, 408 East Harry Street. The feature film “Cattle Drive” was released in 1951. Keywords: Arts and entertainment, business and industry, sports and recreation, movies, films, neon, automobile, transportation, street scene, architecture, Wichita. Description: Aerial view looking southwest from current site of Towne East Square Mall (Kellogg Street at Rock Road). Main thoroughfare in image is Kellogg; its intersection with Woodlawn Boulevard at right center of image. Oil wells and derricks in foreground. Eastborough is located along right border of image; Eastridge addition and other housing developments are also shown. Description: Group photo of members of the Order of the Eastern Star, a women's fraternal organization. Members identified on original photograph. Taken April 6, 1952. Keywords: Wichita; organizations, clubs and groups; women; African Americans. 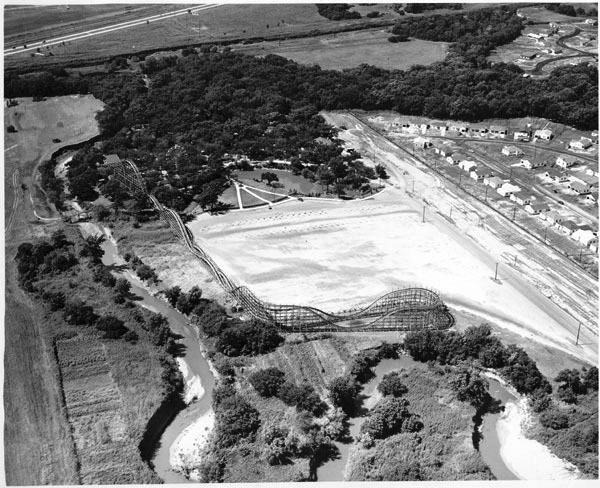 Description: Aerial view looking west toward Joyland Amusement Park, 2801 South Hillside Street, showing roller coaster and Ferris wheel. New home construction is evident in Pawnee Ranch subdivision on north; Gypsum creek meanders in south and east. Joyland opened in 1949. Keywords: Wichita, arts and entertainment, sports and recreation, business and industry, aerials, residences, rivers, amusement parks, roller coasters, Ferris wheels, Joyland. 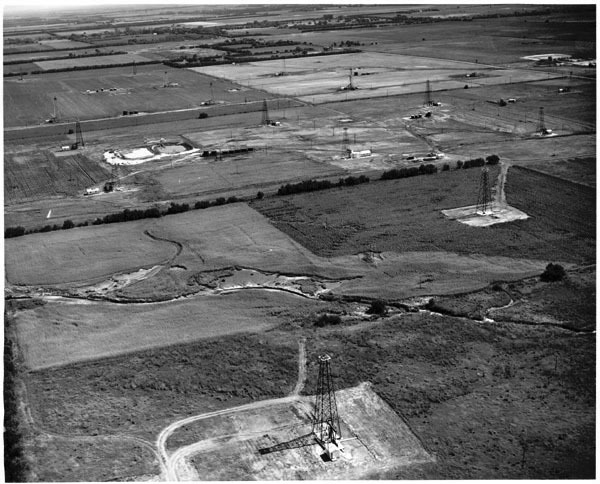 Description: Aerial view of oil wells near Rock Road and Kellogg Avenue. Keywords: Wichita, aerials, business and industry, oil wells, derricks.